Geoff Swaim Needs Surgery, Should the Cowboys even use a Tight End? 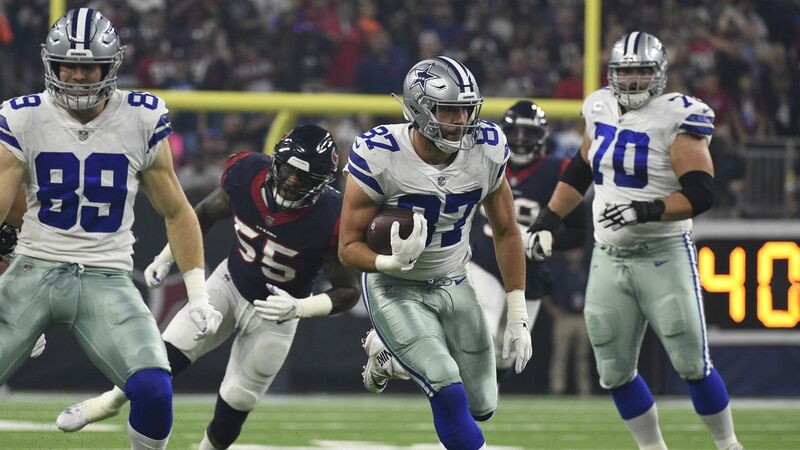 Well, the injury woes continue to mount for the Dallas Cowboys with news coming down this evening that Tight End Geoff Swaim broke a bone in his wrist in the 22-19 win over the Atlanta Falcons on Sunday. The injury will need surgery which will mean Swaim will be out a while, if not for the rest of the season. In previous seasons this wouldn't be much of a blow to the offense, but Geoff Swaim has been the only tight end that the Cowboys have ben able to rely on this season. Dalton Schultz is a rookie, Blake Jarwin's been inconsistent, and Rico Gathers still isn't fully trusted. With the Dallas Cowboys and Offensive Coordinator Scott Linehan's insistence on using a tight end, it seems there's a huge hole at the position heading into Sunday's first place showdown with the Washington Redskins. But in reality, is there? For weeks, I've been screaming for this team to use more 10 personnel (one running back and zero tight ends) as its primary passing formation because it gets their best pass catching weapons on the field at the same time. Swaim has been solid and consistent in his first year as a starter, but the rest of the tight end group has disappointed. So why even run a tight end out on the field. The Dallas Cowboys have options that could replace the tight end in the passing game without actually using a tight end. First, they could use Noah Brown as the de facto tight end. He's been one of the best blockers on the team in his first two seasons with the team and this is the type of role he's made for. Split him out wide and motion him in tight when you want to run. He can be a threat down the seem and in the red zone with his athleticism. He'd be a mismatch for the linebackers that try to cover him and could open space underneath for Cole Beasley. Brown is also a really good run blocker, so having him on the field doesn't negate what you want to do in the run game. The other player the Cowboys coaching staff could work into more of the tight end route responsibilities is Allen Hurns. Hurns is a really good route runner, especially in the middle of the field, where the Dallas Cowboys haven't received a lot of production. You can put Hurns in as the fourth wide receiver and split him a couple of yards off the tackle to give him a cleaner release than a TE might get and have him run "Y-option," shallow post routes, or drags. He can be a threat in the passing game if put in situations where he can excel. See below for something Allen Hurns does really well. In fact, by going four wide receivers with Brown or Hurns on the field, it's possible the opposing defense is forced to run more of dime packages against the Dallas Cowboys 10 personnel. Why would you want to get teams into dime packages? Most NFL teams have two pretty good linebackers that they can deploy in nickel situations, but teams rarely have four corners that they can put on the field and feel really good about. So, if you can force teams to remove one of their 11 best players for a backup corner back or safety, you are already winning that matchup. That matchup would also get you into much more favorable defensive fronts to run against. Even if the opposition put seven or eight in the box, it would be against smaller personnel like corners and safeties instead of a second linebacker. Running 10 personnel as their base offense moving forward would be unconventional, but with an opportunity to take control of first place in the NFC East on Thanksgiving, now is not the time for conventionality. Cowboys’ Patience With DE Randy Gregory Finally Paying Off?